Mankind was my business. The common welfare was my business; charity, mercy, forbearance, benevolence, were all my business. The dealings of my trade were but a drop of water in the comprehensive ocean of my business! I’ve been thinking about the fourfold shown above off and on for the past two years because the US federal government (consisting of the 115th Congress and the 45th President) are by majority members of the conservative “grand old” party. This government hasn’t done much except cater to the wealthy and powerful, undo environmental protections, estrange our world allies, and destroy our institutions. Since socialism in any form is anathema to this administration, capitalism is king, and not capitalism with a conscious either. So I present to you four causes as means or four values as ends of capitalism. These values are principles that only a Scrooge could love! For the efficient cause (left quadrant), instead of intentional actions I have chosen the value of Money. Finances, wealth, and currency are other synonyms. Money grants the bearer supreme choice in what they can obtain or choose to do. Laws try to restrict the choices that money can be used for or the circumstances where it can be used. For the material cause (bottom quadrant), instead of substantive parts I have chosen the value of Property. Ownership and capital are related concepts. You really can’t use something to make something else unless you own it, so owning as much as possible is paramount! For the final cause (right quadrant), instead of normative performance or function I have chosen the value of Power. Influence, capability, potential, authority, capacity are all related. To find out if power is an end in itself, ask the capitalist! 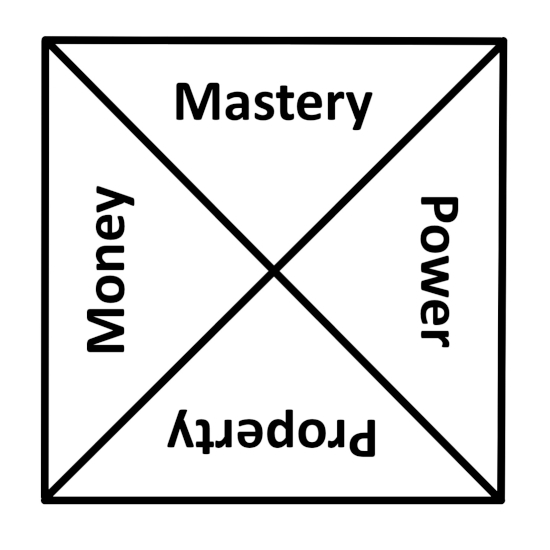 For the formal cause (upper quadrant), instead of necessary structure I have chosen the value of Mastery. Information, understanding, knowledge, or purview are options, but not as nicely nuanced as mastery. Power is nice but without mastery it’s aimless. Mastery is great but without power it’s useless. As more and more wealth is acquired by fewer and fewer individuals, it may be time to rethink what our actions as a nation have given us on these last dark days of 2018. But a nice incremental change is coming next year and it is none too soon. Put that in your Christmas pipe and “smock” it! Some might think that since I promote a fundamental physicalism (informed by fourfolds) that I endorse economic materialism or even a predatory capitalism “red in tooth and claw”. Physicalism is a metaphysical stance towards the natural world whereas economic materialism is usually thought to be one of the bad aspects of consumer culture. This entry was posted on December 22, 2018 at 9:09 AM and is filed under fourfolds. You can follow any responses to this entry through the RSS 2.0 feed. You can leave a response, or trackback from your own site.